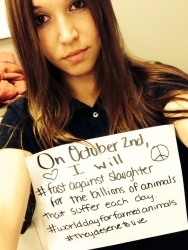 On October 2nd, animal rights activists around the globe will fast in solidarity in observance of the 36th annual World Day for Farmed Animals. Bethesda, MD, September 14, 2018 — Tuesday, October 2nd, animal rights activists around the globe will fast in solidarity in observance of the 36th annual World Day for Farmed Animals. World Day for Farmed Animals takes place annually, on or around October 2 in concurrence with Mahatma Gandhi’s birthday. 2018 marks the 36th anniversary the international day of action which includes vigils, marches, demonstrations, and social media advocacy. “The greatness of a nation and its moral progress can be judged by the way in which its animals are treated,” Gandhi famously said. For more information, please visit www.DayForAnimals.org. For more than 30 years, Farm Animal Rights Movement (FARM) has worked to end the use of animals for food through public education and grassroots activism. As FARM has grown, so has public awareness of farmed animal abuse and the benefits of veganism. FARM has been active since 1976 and was incorporated as a 501(c)(3) national non-profit in 1981. FARM, recognized as one of the best charities in America by Independent Charities of America, is based in Bethesda, MD. The organization is funded by contributions from individuals and foundations that care about animal rights, human health, and environmental integrity. For more information, please visit http://www.farmusa.org.